BARGAIN DECORATING WITH LAURIE: PORCH PARTY! Today I am joining Mary at Little Red House for Mosaic Monday and Rhondi at Rose Colored Glasses who is hosting her own birthday celebration at Porch Parties all over Blogville. Please drop by both of these lovely blogs. Saturday, our children and their spouses and all of our grandchildren were swimming at our house, and my husband was grilling, so I decided to make things a little more festive. I used a beach theme, so I used sandbox sand to disguise the light cords. The little sand castle is a candle holder, so that added another element of light to my table. Don't forget to go to Little Red House and see Mary's lovely Country Living Mosaic and get links to the other mosaics in Blogville and go to Rose Colored Glasses to attend the lovely party on Rhondi's porch and to get a list of all of the porch party participants today. Thank you so much Mary and Rhondi for letting Blogville join these fun events. You may have noticed that I have modified my blog name. When I started this blog, I really thought it would be all about bargains, because I'm all about bargains...well, I'm all about bargains AND chatting! (I'm just going to pretend that you haven't noticed that I do not have a shortage of words-yeh, and I'm going to pretend that you aren't laughing out loud right now too!) So now, my blog name is "Bargain Hunting (and chatting) With Laurie. Please don't run away screaming! This title modification does not mean I'm going to do even more chatting on my blog. It just means that I am acknowledging that I already do a lot of chatting on my blog. Well, that is just stunning. I did notice your blog name change. Blogging is definitely about chatting. It's what we seem to do best. I'm going to have to check out that floating table thing. What a beautiful table. I like your new name! Have a wonderful day! Love the blog dress & your newly modified name. Chatting with you is always a pleasure! Your floating table is awesome! Great idea with the sand. Well I for one enjoy your chatting...it is charming, informative and always so interesting. I think it's great that you have the gift of gab! I think it's great to have a story to go along with your photo's! I wish I was better at it! You did such a great job on all your mosaics, but the the lit beachy theme is totally inspiring!! Great job! I think your table gets my "WOW! of the day" award (although I don't really have such an award -- but if I did -- I would give it to you!) and I love both -- your bargains and especially your chats! very funny at times and very inspirational. I sure enjoy your stories. a great big hug...thanks for inviting me. Always so creative and imaginative!!! I hope it rubs off on me;)!!! Your floating table is stunning...I wish I could see it in person!!! All of the mosaics are wonderful!!! I think the addition to your banner is perfect!!! One of the things I look most forward to is chatting with you!!! Have a wonderful day, sweet Laurie!!! I noticed your name change. :) We love chatting with you so I'd say the new name works! Your patio is gorgeous! You have so much energy to get things done. Laurie your floating table looks magical and your mosaics are stunning, I saw your name change and I love chatting with you too, happy Monday, Kathy. Laurie, you did a wonderful job with this! It's just delightful! Thanks for sharing this lovely tablescape and your pretty porch with us. BTW, I'm in love with those twig rockers, too! Hi! wow! just beautiful pics! 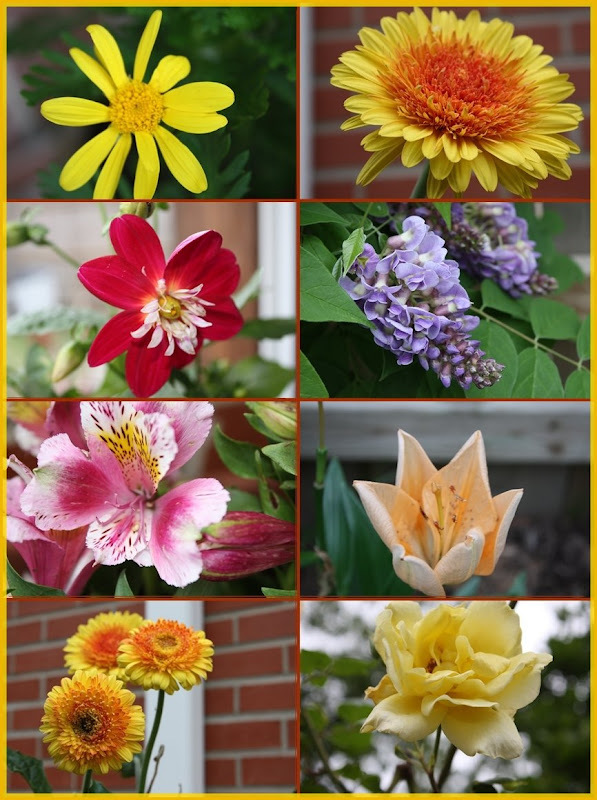 what a nice flowers collage! That floating table is just the coolest thing! Thanks for sharing. Come on by and visit my porch. Laurie this is just so great. I love the sand theme and it looks fantastic. I noticed your lovely new blog header right away. It is always a pleasure to visit you. What a creative way to light up the table. It looks wonderful. I like the twig chairs you have too. I like the look a lot! I like using lights. Thanks for the idea! I have these white corded/red,white, and blue lights...July 4th thoughts! Change your blog name all you want, we don't need to be and do the same all of the time. My blog is a little psychotic, like me. I love decorating, gardening, cooking, parenting, and am in recovery with Al Anon. It's just a weird wacky way for me to organize and display all these parts of me. Isn't that neat! I LOVE it. I haven't seen anything like that and I think you did a great job. That was a great theme because you had the sand castle and the shells and all...I don't quite get how you do it. I suppose you need to start with a glass table top?...hmmmmm...its a magical mystery to me. I know how it is when I'll be someplace and all of a sudden I'm in a panic..hold it..hold it...I need to get a picture!!!! and then when I say its for my ... blog....I feel silly. Well...they just don't know..do they? huh? Your table looks perfect. Great idea. I noticed the change in your blog name...I like that. I had noticed the name change & I like it! Your floating table turned out fabulous. And I can totally relate to the "blogging" comments. Everytime I take a photo now, hubby says "Its for her blog" and then he rolls his eyes. Some people just don't get us! I almost forgot about Kathleen's floating table thing...I have to think about it.. I don't have icicle lights either.. Glad you reminded me..
Love your mosaic too...very beachy! And your name modification is very appropriate! I got some cute bargains today at Pottery Barn outlet..
What a awesome floating table. Your blog is wonderful and I really enjoyed my visit. I too understand about chatting, blogging and taking pics. Everyday revolves around elements to post. So glad to find you and see you again soon. I love the mosaic, Laurie. I haven't tried a floating table. Yours is beautiful!! I think that floating table must have looked so exciting at night! Oh your table turned out just great! Just like a day at the beach without the sand in all the wrong places. 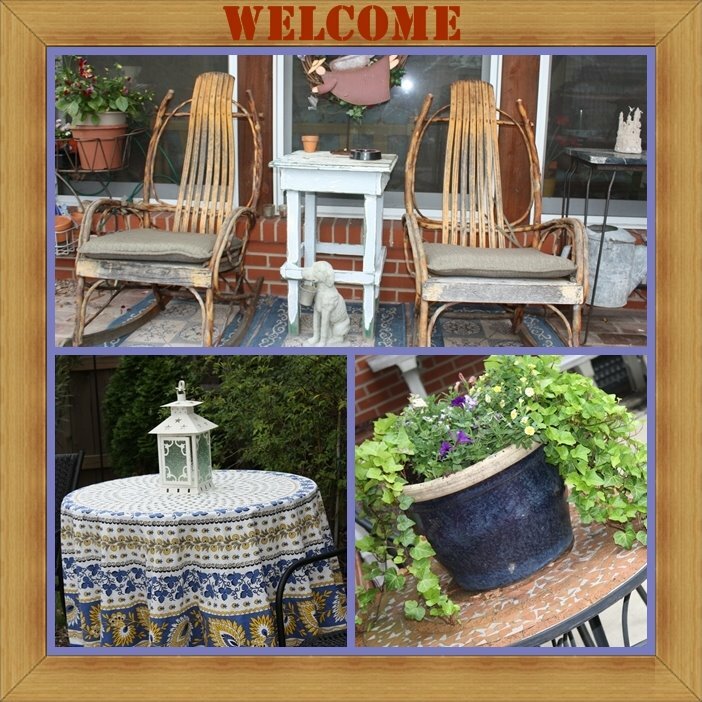 Great welcoming porch scenes and I like the way you put them together. Wow -- that floating table is amazing. I laughed at your family laughing at YOU for the blogging; I have to admit to a bit of teasing from my hubby and daughters, too! Howard says that "nothing surprises him" now! laurie, I love the floating table. It is beautiful! Laurie girl! you are so funny! I like the new name! I've dressed my blog in a new summer frock myself! what a beautiful post...the photos I am sure don't even do it justice either!!! good job! I love your beach theme floating table. I'd like to try a beach theme tablescape soon, but I'm still lacking on some accessories. I used to think I had too much stuff, but ever since I started blogging, I realized that I don't have enough stuff! Well, stuff worthy to take pictures of! I did notice the change on your blog name. And please, chat away! Your chatting always brings a smile to my face! Laurie, your table is absolutely stunning. I know Kathleen will give it a medal. I did see her post, and I do plan to give it a try one of these days. And, your mosaics are wonderful. Thanks for inviting me to your porch party. Wow Laurie - I love your floating table....it is just beautiful ! I bet the guests were in awe ! I also love your flower pictures ! Love your blog so, chat all ya want - we are listening or should I say reading !! LOL ! Noticed the name change right away! Chat on girl! The floating table looked amazing...I would have been thrilled for all the extra effort....what do kids know anyways???? Have a great week. laurie....you have left me speechless! the blessings of your talent shines in this post! 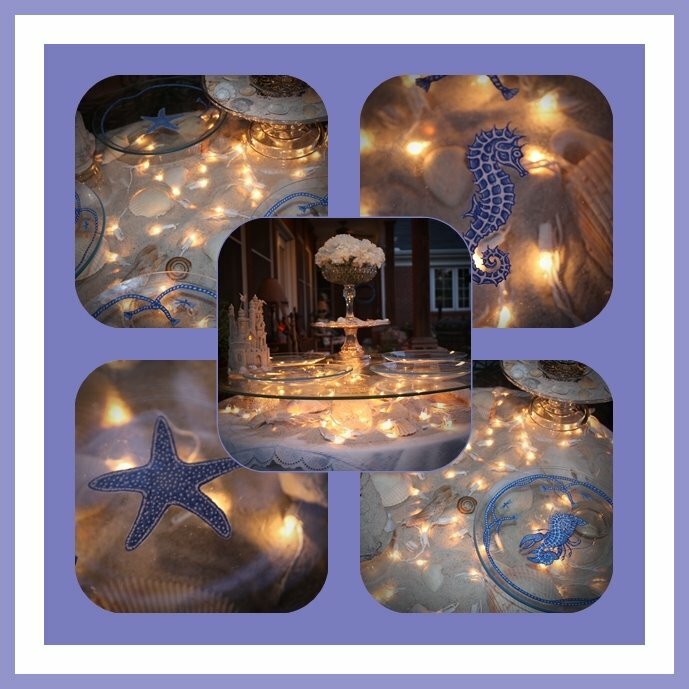 Well I don't know about you...but I think your table came out magical! It's beautiful Laurie! You did good!! Oh also...I just wanted to update you on my sister Estela... she is doing remarkably well. Actually today I am driving her into Los Angeles for a follow-up. Our family is very thankful for all the prayers and I thank you for including her in your prayer list. She hopes to be back at work soon! The Lord hears all our prayers! Hugs! I had noticed the "chatting". I didn't think it was there before. Like the new header too. I don't know....that table looks pretty fantastic to me! I think you did a beautiful job on that! Oh my gosh that is so beautiful! My family laughed at me too- but my husband set about mowing the lawn and getting a new propane tank to help me get ready. This is my first visit to your blog and I love it. Your prayer list is great too. If you dont mind I think I will join it. Thanks for posting! Oh Laurie your floating table looks fabulous!!! I remember seeing the one on Kathleen's blog- yours is just as lovely to be sure! I like your name change- chatting is such a fun part of all this- just wish I had more time to do it these days!! It's so nice visiting your blog again! I'm sorry to have strayed for so long. :-) I have cleaned for 5 solid days...the house was a wreck!! Going camping this weekend and then hope to just Relax in blogland again! I LOVE LOVE LOVE your header!! Ahhhhh...just love vintage! 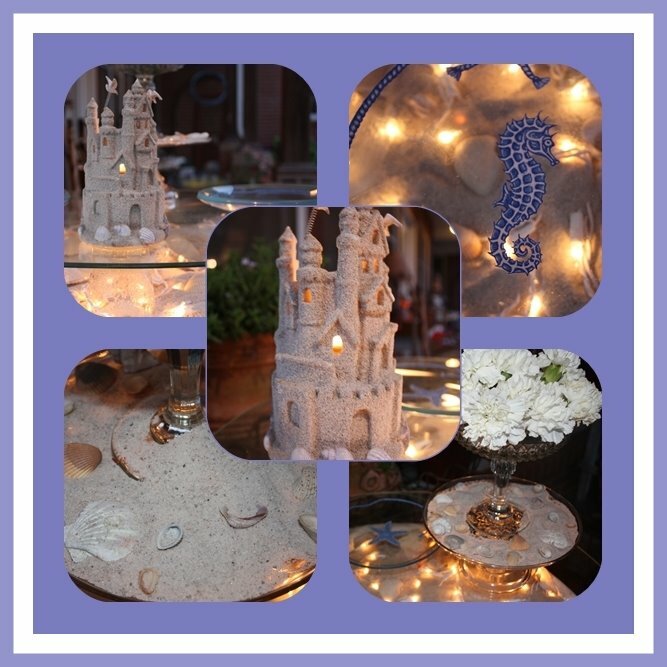 those lights are soooo pretty and the sandcastle... you know me... blue and white - my favorite! I love, love, love that sandcastle! It looks so pretty with all the fairy lights. Great idea! Laurie, after seeing pictures of the inside of your home, I just knew the outside would be spectacular as well and I was right. What a statement that table makes! I just love it and will have to zip over to that other blog to get some more ideas! Thanks Laurie and have a great day! Now I love your new look and like your new name. Bargains are good and so is chatting! We're gals afterall! Laurie Eve..love the Beach theme and the floating table thingey! You are a quick study! Like the new blog name and layout..very cute and appropriate..
Laurie, you have elevated the art of tablescaping to new heights, girl! AMAZING!!!!!!!!!!! LOVE , love , LoVe it! Laurie, Don't ever stop chatting !!! You have such interesting stories and, btw, I love your table in the sand. You really must have a great imagination. I wish you had time to finish your story, but in due time. some and I fear I will send the blog off into another planet. Even if I am a non-dish girl....I still know enough to see that your created MAGIC!!! Love the floating table! I take the sandcastle, I think you did so good! I missed this and wanted to do it! I even bought a few things for it. Oh, I so behind! Laurie it turned out lovely. Love those chairs on the porch.